The expedition of a lifetime, the chance to stand above the Arctic Ocean at the North Pole, a point known to so many but visited by so few. 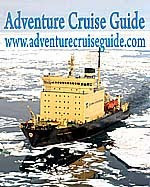 Join that élite club that have visited the North Pole travelling aboard our Russian nuclear powered icebreaker from the port of Murmansk through the Franz Josef Archipelago and deep into the polar ice to arrive at the Geographic North Pole. The main purpose of this expedition is to visit the geographic North Pole but there is a lot more to this experience than just simply visiting the pole. This is a voyage into the very heart of the Arctic, as the ship navigates through the polar ocean there is excellent wildlife viewing opportunities. Franz Josef Land is visited as part of this expedition and the opportunity to explore a remote and seldom visited region of the Arctic which is historically very significant is a rare opportunity. There is also the spectacle of sailing aboard the most powerful icebreaker ever built, these nuclear powered vessels were designed with strength and power in mind to face even the strongest Arctic ice and to watch her breaking ice is a marvel of machinery.